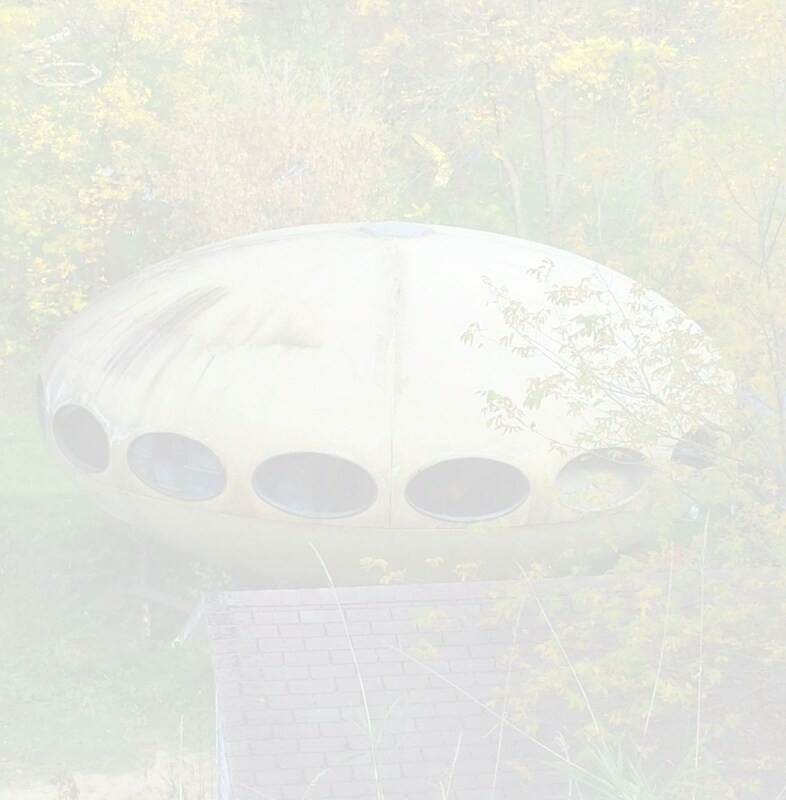 Featured Image From The Owner | Image Date 2013? I have always been a dog lover and so I particularly enjoyed this photo that was recently posted to Instagram by churchill_thebulldog. 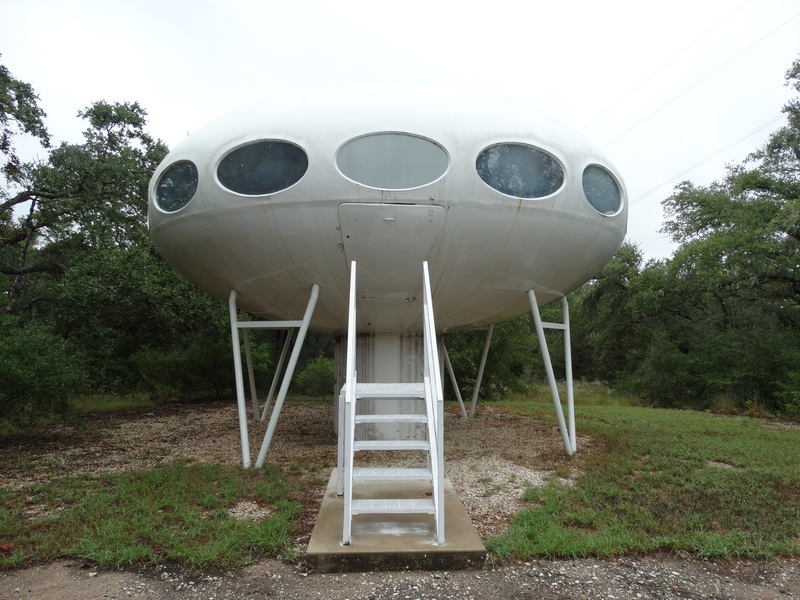 Yates Cattle and Conservation Ranch, the property on which the Austin Futuro sits, has been listed for sale and the photos and video below show the Austin Futuro, the "Dome" which is also located on the property and a video slideshow with other photos of the property. 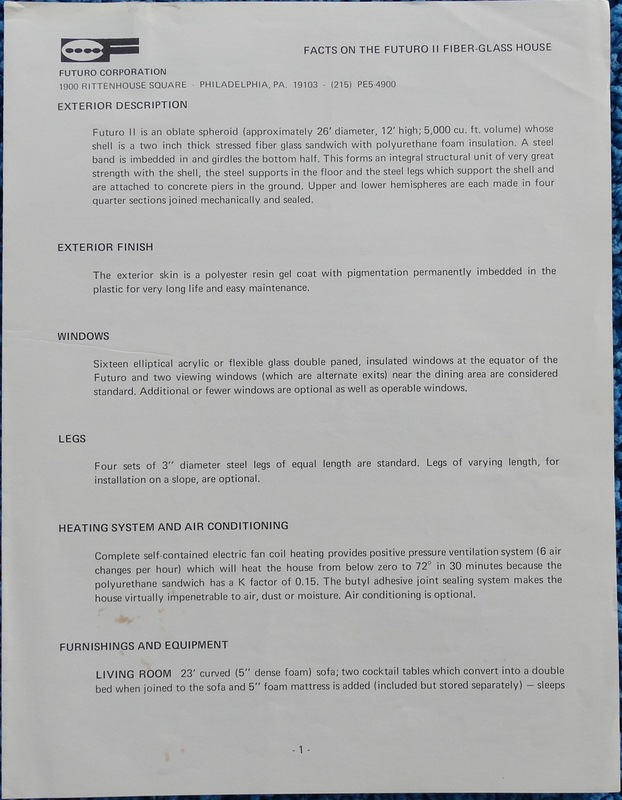 More information can be found to the right. 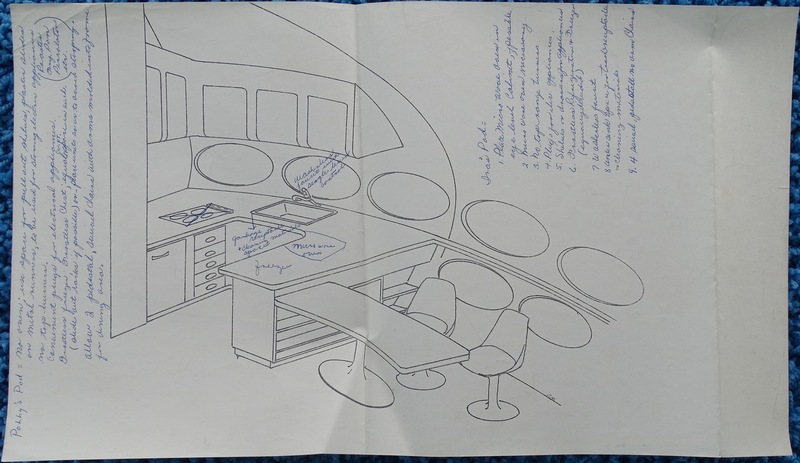 I visited the Austin Futuro on 091314; my thanks to owner Ira and Terry for spending time with me and allowing me to take photographs not only of the Futuro but also of some original plans, drawings and documents from the time of the Futuro's purchase. And yes I have to start with the obligatory photo of yours truly and the Futuro! 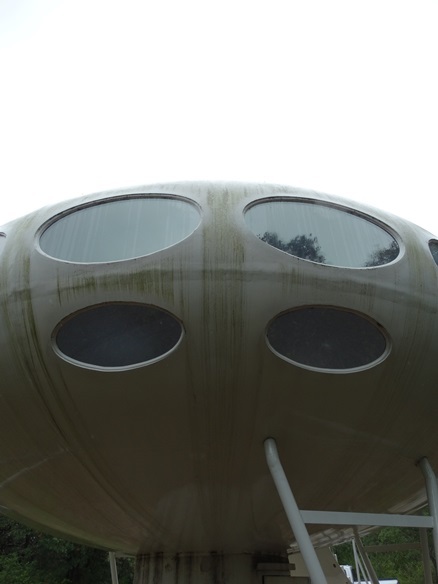 These photographs show the exterior of the Futuro. The finish is in rather good condition and the unit is notable for the fact that it is mounted on 8' legs. 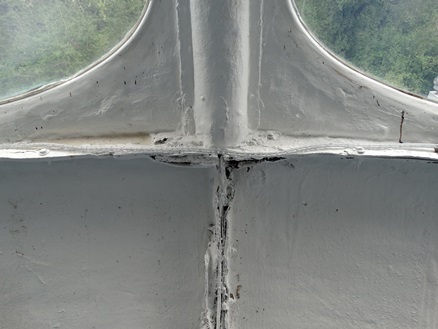 The window configuration is the most common US configuration of 16 windows around the circumference of the unit with two lower viewing windows. 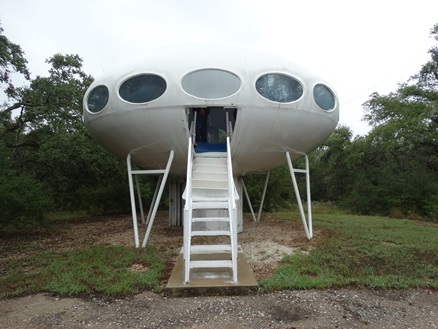 The Austin Futuro is mounted on 8' legs but it retains the standard door. 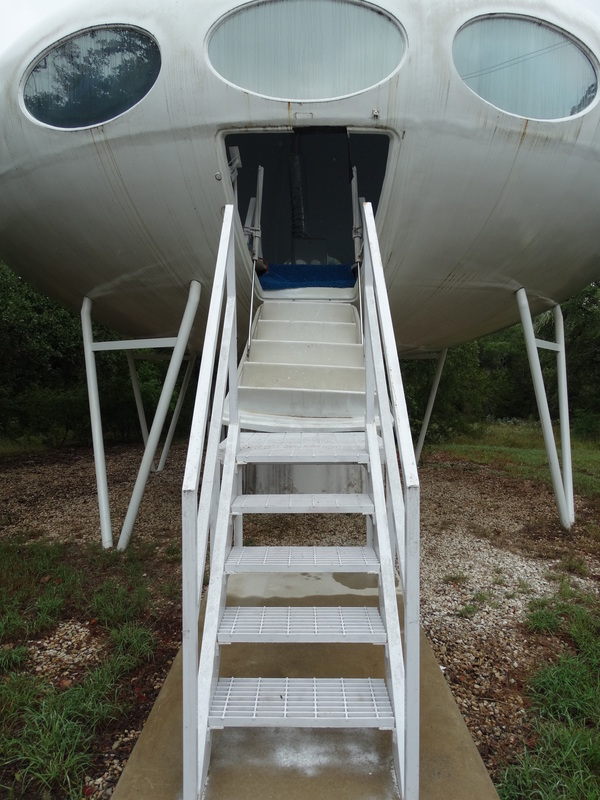 An additional set of concrete steps is installed and the door lowers to the top of this set of steps. 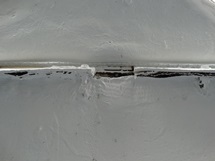 The door mechanism is not original and was replaced some time ago. 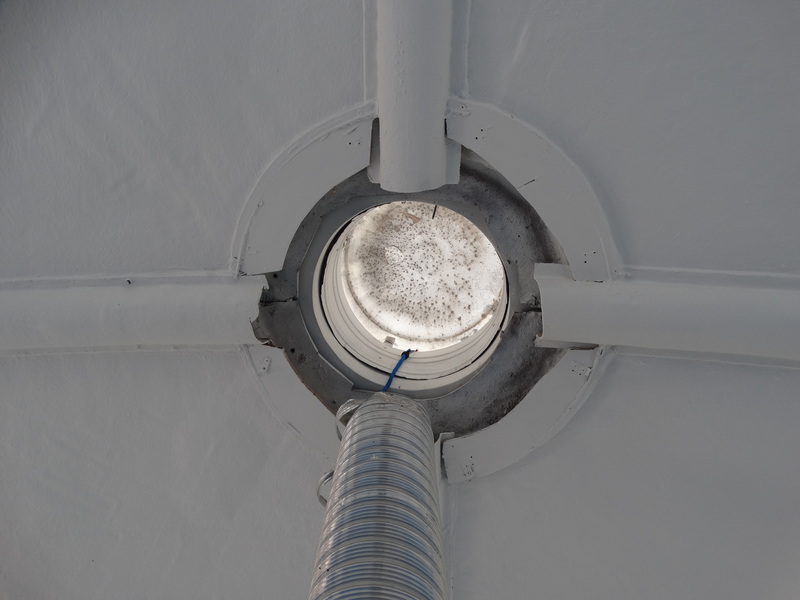 The door mechanism is controlled [from outside the Futuro] by means of a switch installed in the "tube" under the unit. 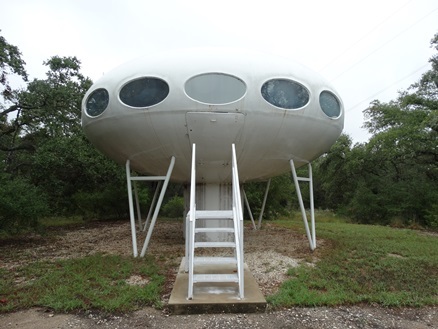 Despite the fact that the Austin Futuro has never been moved the join between upper and lower hemispheres does show signs of deterioration as do the factory sealed joins between adjacent sections of each hemisphere. 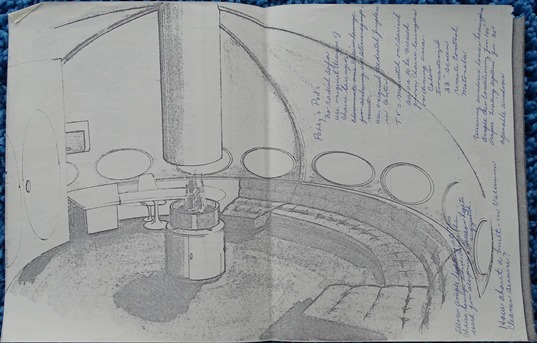 This set of drawings shows some of the interior features of the Futuro as delivered to Austin. 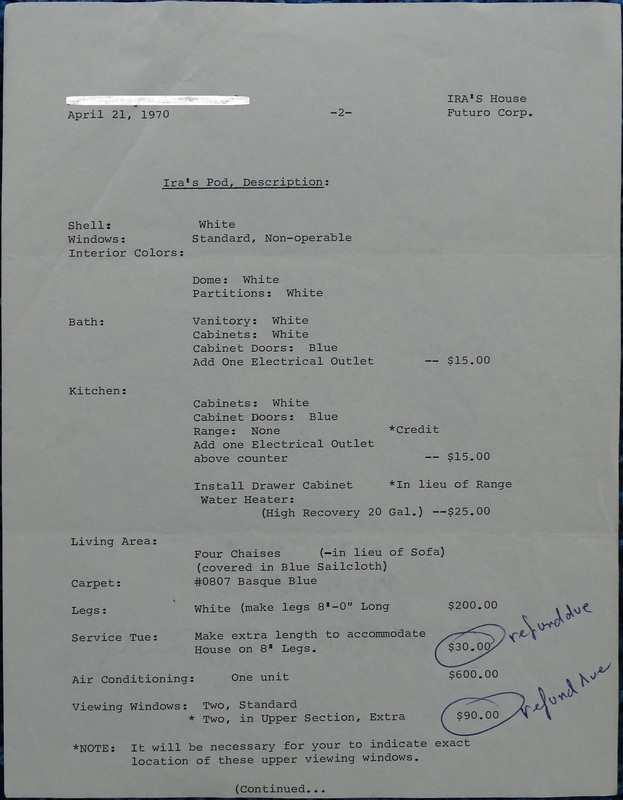 The handwritten notes are by Ira's mother and "discuss" various options for customization. 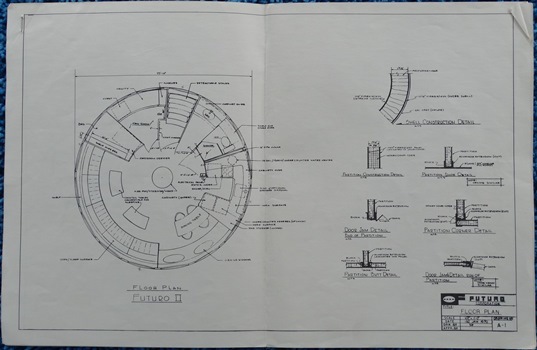 The architectural drawings seen here are all original from the time of manufacture and installation of the Futuro. Interesting to note is that there are two different versions of the Electrical Plan [E1] and the fact that there are drawings showing both a radial steel construction of the supporting structure for the floor and also a different version which appears to show a parallel configuration. 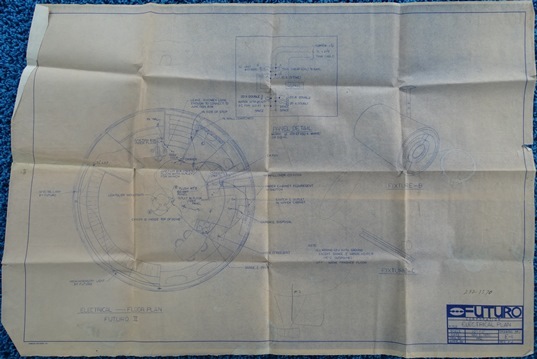 The first two plans listed are full size architectural "blueprints", the second two are smaller architectural drawings [that do not have the "blue" hue that presumably gives "blueprints" their name] and the remaining 5 are a set of copies of plans on smaller white paper. 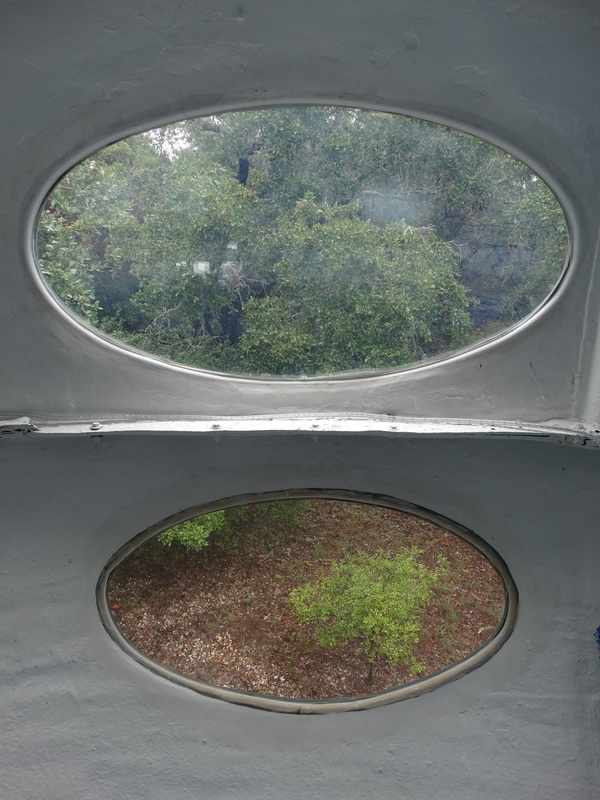 The featured image above and the two images below were sent to me by the owner of the Austin Futuro House. I do not have dates for the photos but I am assuming the image above is recent. The photos of photos below are clearly much older. The image showing the Futuro through the trees is from sometime in the 1970's. 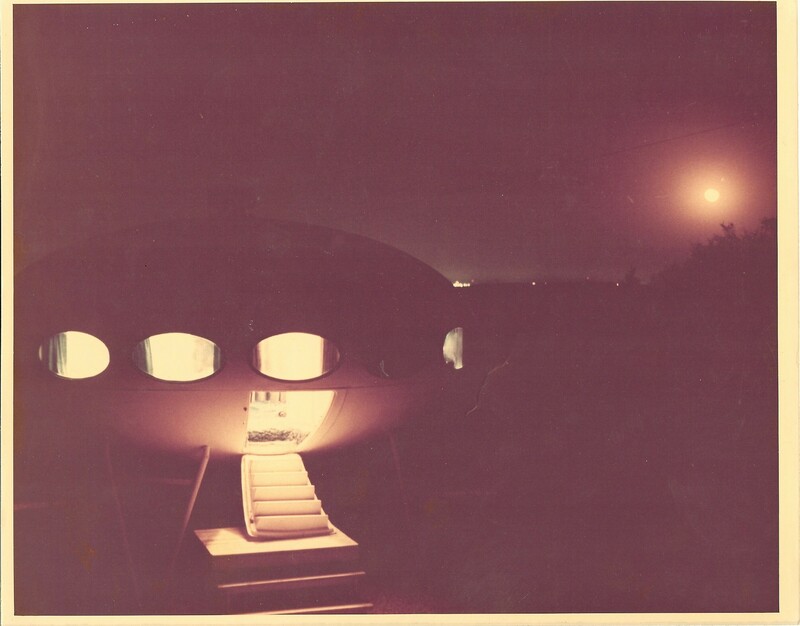 The third, night time, image is hard to place in time though obviously it is also old. The Futuro appears to be the same; the height at which the unit is set, the wooden steps up to the Futuro's built in stairs, the same type of vent on the roof and so on all indicate this is one and the same unit but the view seems to be more devoid of trees than the other photos or the Google Maps imagery. 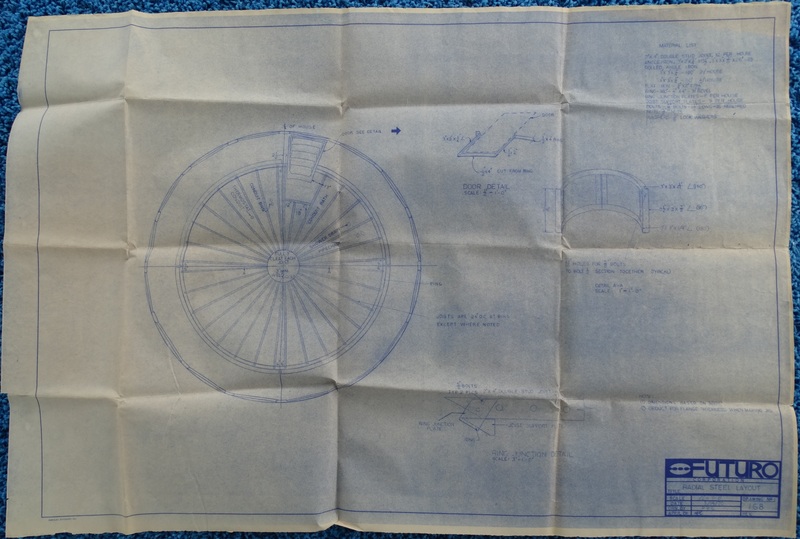 My thanks to the owner for sending me these photos. 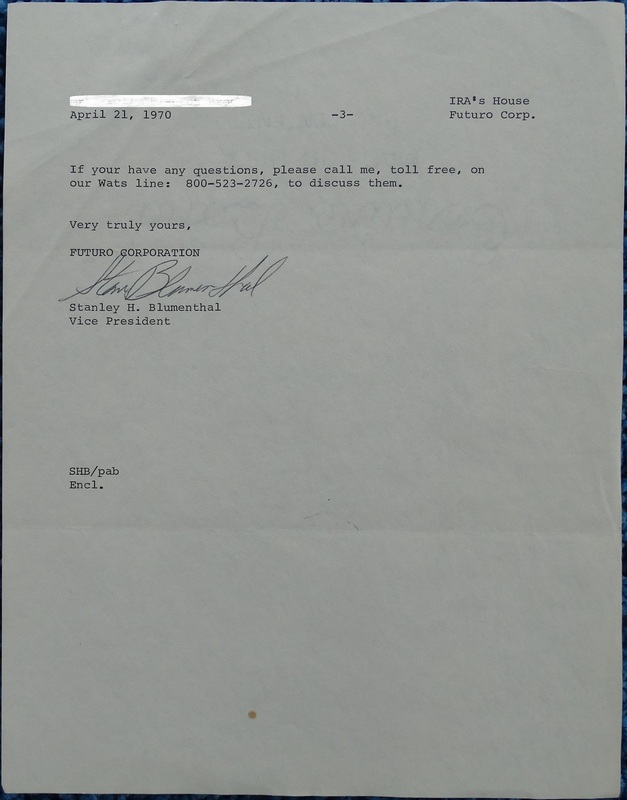 The King Land & Water listing for the Yates Cattle and Conservation Ranch has now ended and the property and the Futuro remains "as is" for now. 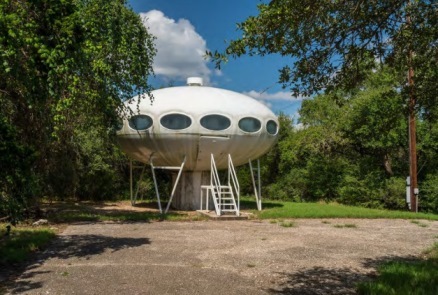 After failing to sell after some 6 months or so on the market the asking price for the Yates Cattle and Conservation Ranch [which includes this Futuro] has now been reduced by a little over 20% to $7,200,000. 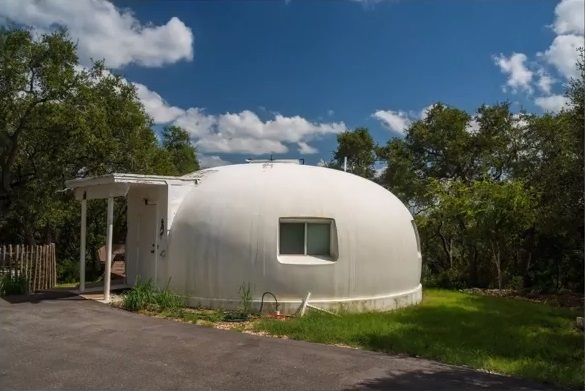 "There is a property in the Hill Country where the bedded limestone strata and the historic layers of time come together to create a place like no other. Only 15 minutes from downtown Austin, Yates Cattle and Conservation Ranch's name says it all: a marriage of rich Texas ranching heritage with an array of unique natural resources in a protected, quiet world all its own. Saltlick is just minutes away, and the amazing restaurants of Austin are a mere short ride away down MoPac Boulevard, immersing you in the culture of music, food, art, nature, and outdoor recreation that makes Austin one of the most popular cities in the U.S. Here, nature balances with activity, livestock with big city lights, and people with solitude. 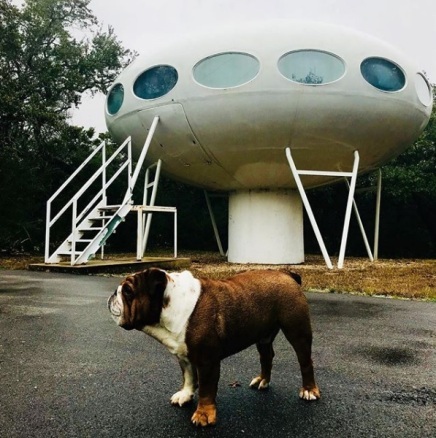 The ranch is centrally-located just southwest of downtown Austin on Bear Creek, fronting on northbound side of Highway 45 where it turns into South MoPac. 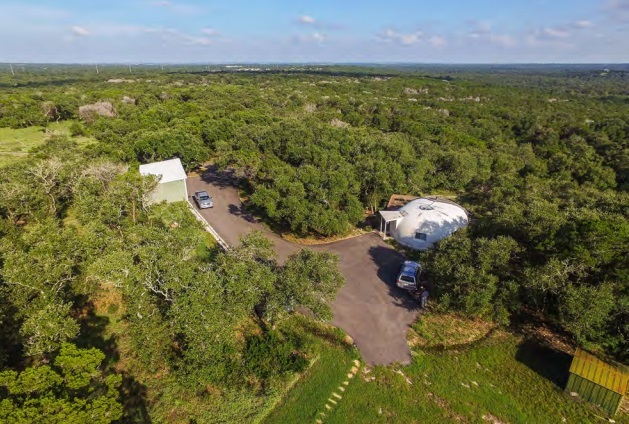 Nestled into this amazing natural setting is a ranch where cattle, deer, neo-tropical songbirds, bats, turkey, people exist together in a balanced ecosystem for nature and man. Enter the ranch and enjoy the tranquility of nature at its best with immediate access to all the amenities of Austin. Location and beauty makes this ranch exceptional." 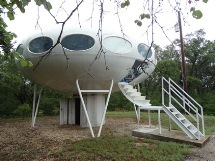 The property includes several improvements and among them is the Austin Futuro. 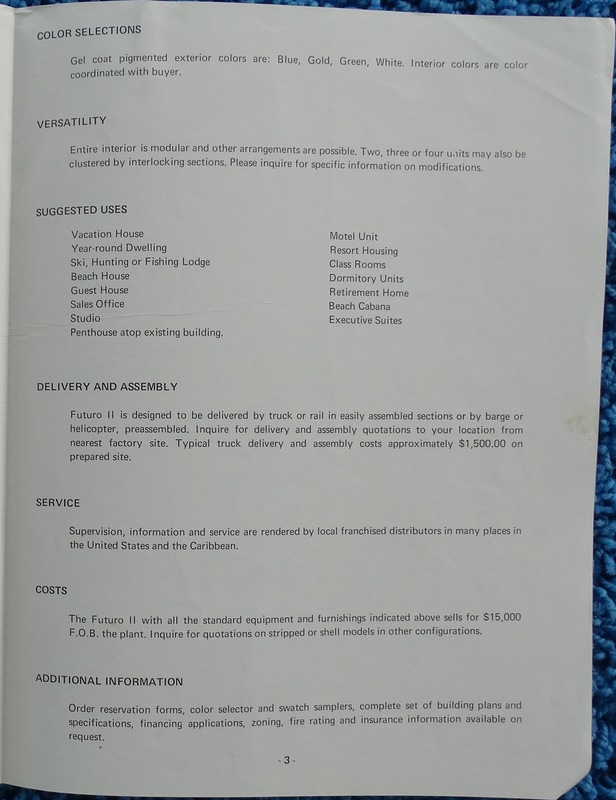 So, not even a need to find a "home" for your new Futuro and deal with the complications and difficulties of relocating one. 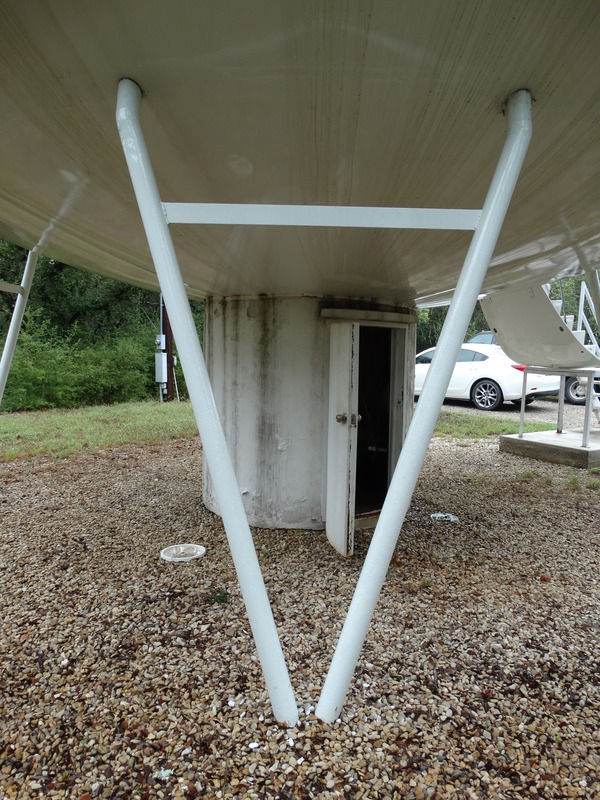 As an added bonus there is also the "Dome", a second "futuristic" structure, on the property [see photos at left]. I am by no means wealthy but I am fortunate enough to have a good job, live a reasonably comfortable life and only infrequently feel the wish for "more". This however is one of those infrequent times where a tinge of jealousy for those more fortunate surfaces, even if only for a short time. Were I one of the ultra-rich I could certainly see me going for this; a pretty awesome property [I visited the property in 2014 so I speak with the voice of experience], a fantastic location that gives the feel of country despite its proximity to city and a Futuro included - what could be better? 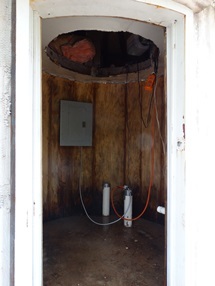 Full information about the offering can be found in the King Land & Water listing which includes descriptions, photos, maps and a slideshow. 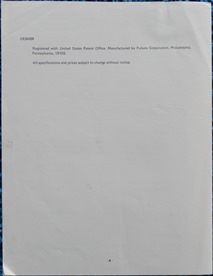 A "packet" containing most of these can be downloaded here. 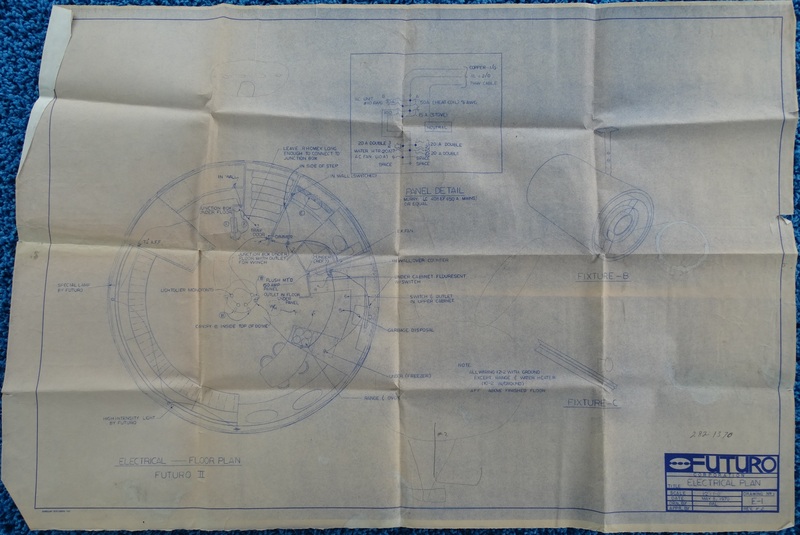 On 091314 I had the opportunity to visit the Austin Futuro; in addition to seeing and photographing the Futuro I was also able to look through a collection of original papers, drawings and plans associated with the Futuro that Ira, the owner, had kept. 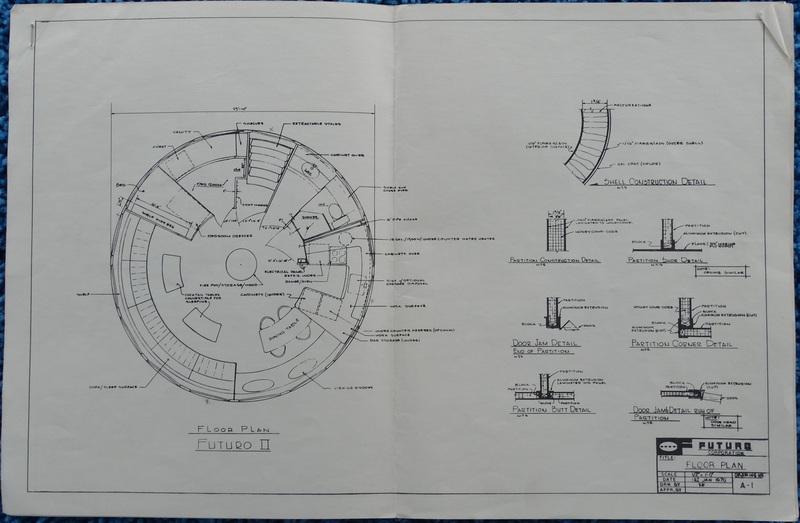 I would like to thank Ira, and Terry who also accompanied us, for spending time with me, chatting about Futuros and allowing me to photograph some of the archived papers. 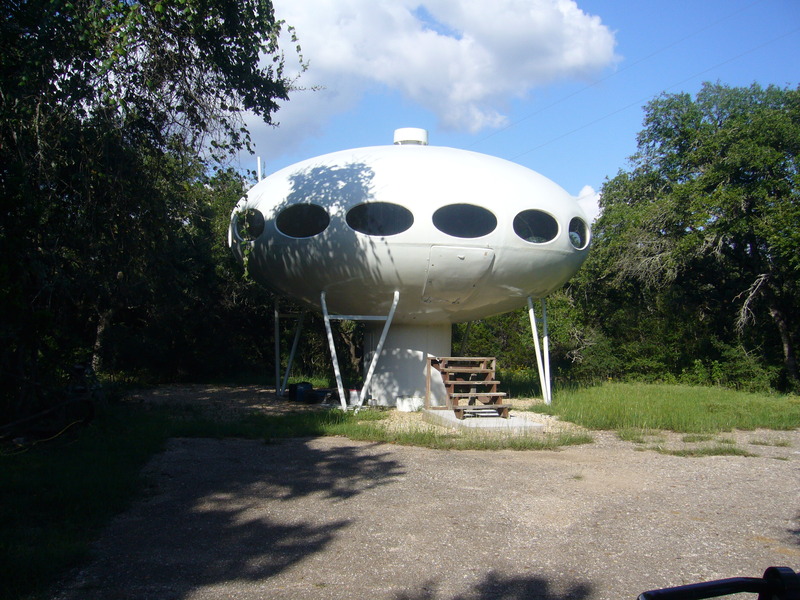 The Austin Futuro was purchased in 1970 and has remained on the same site since. 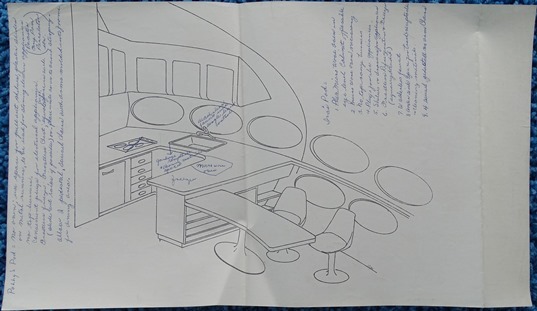 Ira's mother was very interested in all things "space" and "futuristic", as were many people at that time, and the family took a trip to the Futuro Corporation in Philadelphia to look at the Futuro with a view, at that time, to purchasing two of the units. In the end only one Futuro was purchased; "Ira's Pod", and a different but similarly constructed "dome" was purchased for Ira's mother [which also still remains]. 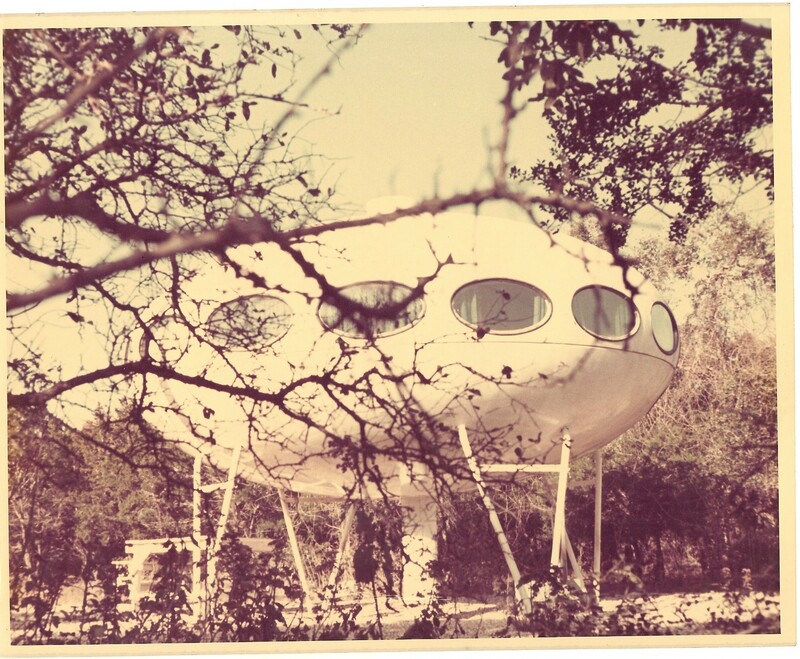 Ira recalls how the Futuro they visited in Philadelphia was actually different in several ways from the one that was eventually installed in Austin. 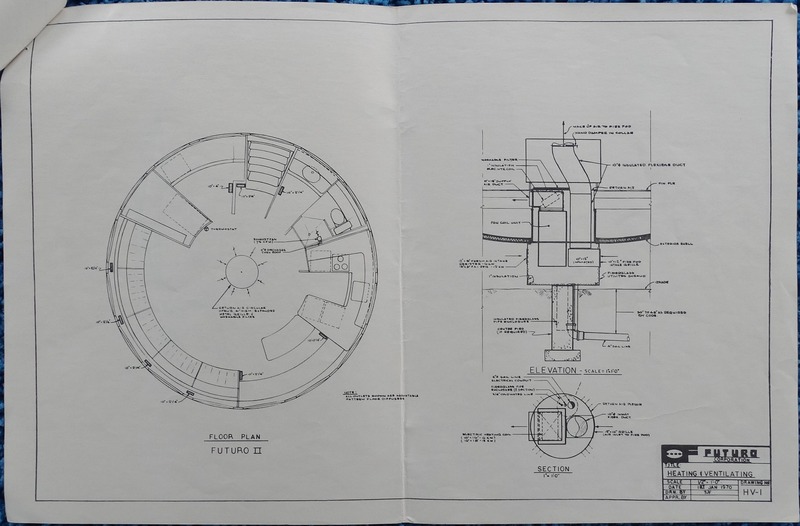 For example the unit in Philadelphia featured doorways with the "hatch style' seen in the original Finnish models where you would have to step over the lip at the bottom when passing through but the unit installed featured traditional doors with the bottom being flush with the floor. 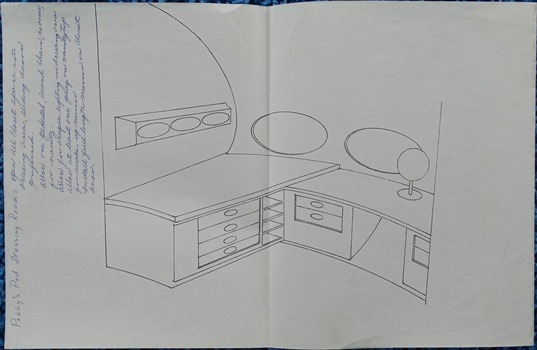 In talking with Ira it became apparent that there was a great deal of opportunity for the customization of Futuros; mainly the internal fixtures and fittings but also the window configuration, the support struts and so on. 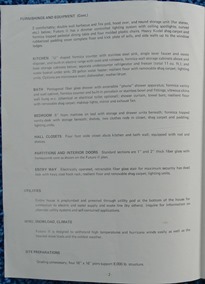 I always knew that there were some options to customize but did not realize quite the extent to which that was offered. 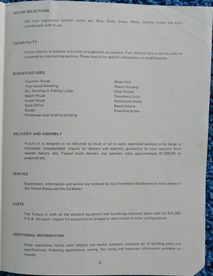 The document shown below is a Fact Sheet about Futuro II, "Facts On The Futuro II Fiber-Glass House", and it lists some of the items that were available for customization [this document is very similar, but not identical, to this Star Enterprises, Janesville, Wisconsin one which was sent to me some time ago by the Hedberg Public Library in Janesville]. 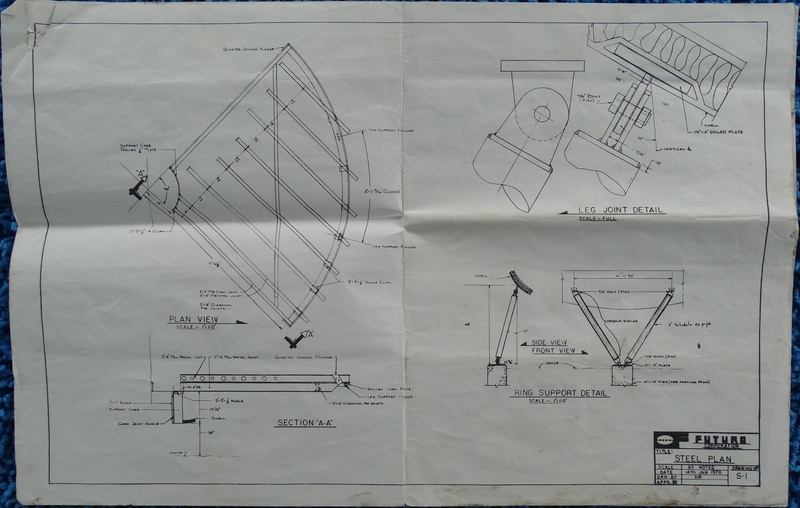 Among the customization options listed are the window configuration, additional or fewer or operable being among the options, differing lengths of support legs and the ability to "cluster" units by the use of interlocking sections. 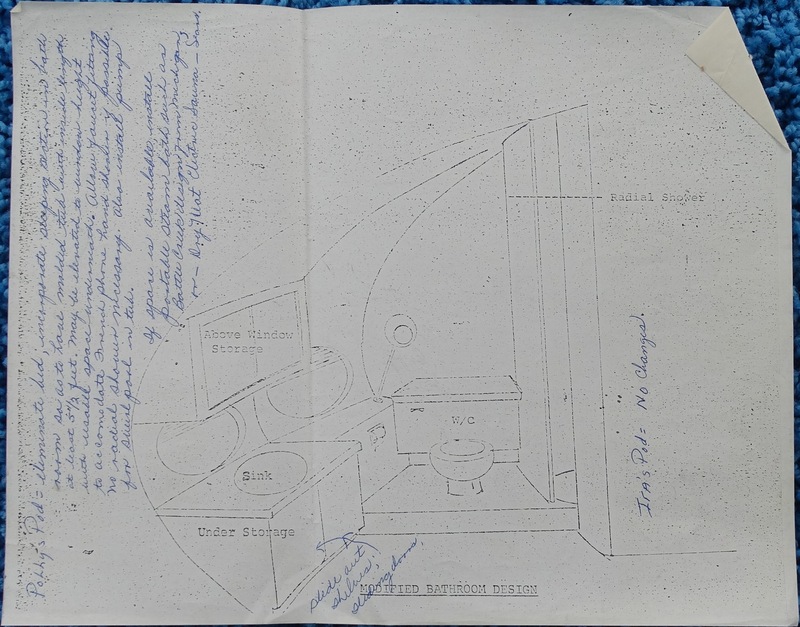 The set of four drawings at left is a further illustration of the ability to customize; they show various aspects of the interior configuration of the Futuro being constructed for Ira and we can also see notes made by Ira's mother "discussing" further options and requirements. 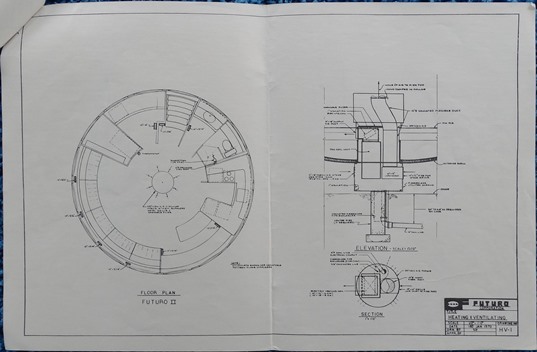 Ira tells me that the unit as installed matched these drawings very closely. 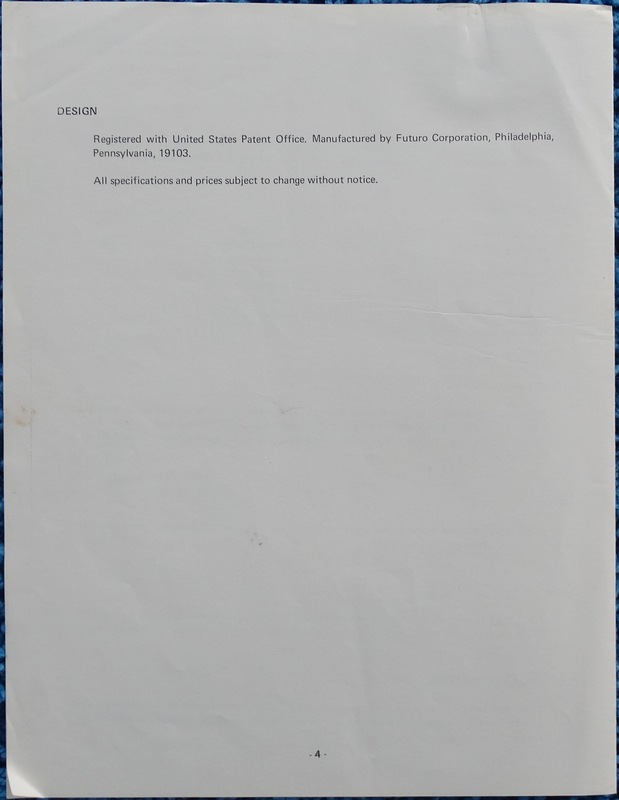 The letter below from the Futuro Corporation of Philadelphia Vice President Stanley H. Blumenthal, dated 042170, details the final delivered configuration of "Ira's Pod". The Austin Futuro has a window configuration that includes the most common US configuration of 16 windows around the circumference of the unit and two lower "viewing windows" rather than the four in two rows of two commonly found in the European Futuros. I only recall a single Futuro with upper viewing windows installed, the Futuro House in Frisco, NC [though frankly my memory is not what it once was and there may be more I am not recalling right now]. 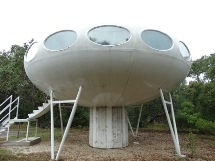 Ira tells me that the reason for the 8' legs and the higher than normal mounting of the Futuro was so that you could view the skyline of downtown Austin from the Futuro. Some 44 years later the trees have done what trees do and grown and the Austin skyline is no longer visible from the Futuro. 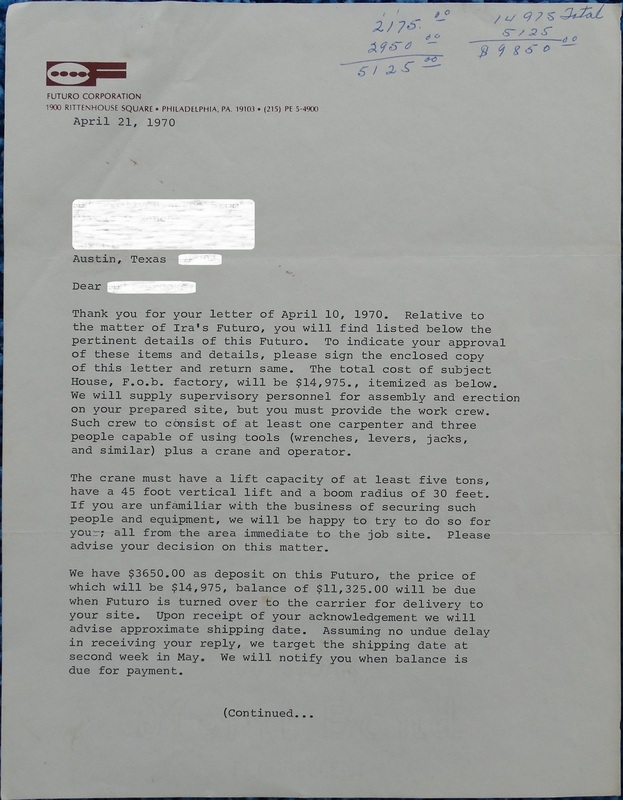 The letter also indicates that while the Futuro House Corporation would supply "supervisors" for the installation of the Futuro the purchaser would be required to provide a crane and suitable work crew to undertake the actual work. 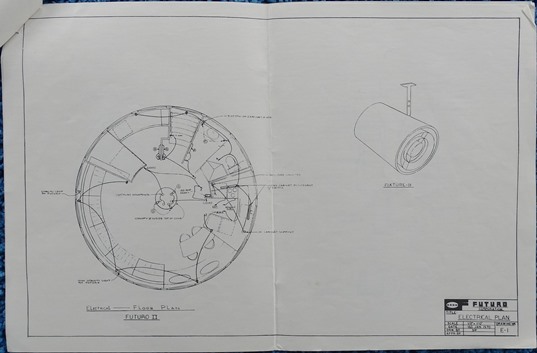 As specified in the fact sheet above the Austin Futuro was delivered in two pre-assembled hemispheres [upper and lower sections were manufactured in 4 sections which were then mechanically joined and sealed]. 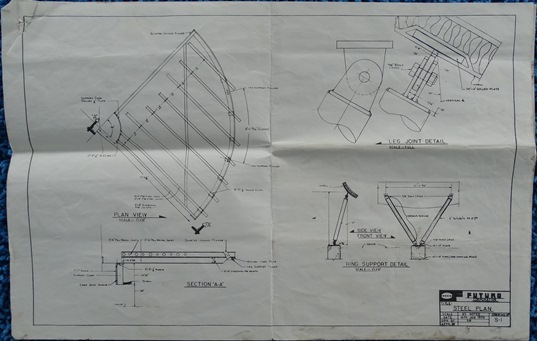 The two halves were joined and then the unit was hoisted by crane and the 4 support legs were installed and attached to the piers. 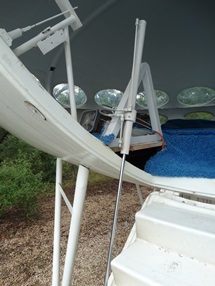 The carpets and seating chosen for "Ira's Pod" were blue as indicated in the letter above. Ira even kept a "swatch" of the fabrics chosen and a shot of this can be seen at left. "Basque Blue" was chosen for the carpet and the seating was covered in blue sailcloth described on the "swatch" as Peacock Blue #14. The Futuro Corporation offered a one year warranty on the Futuro House with the internal fixtures and fittings being covered not by the Futuro Corporation but by the original manufacturer's. 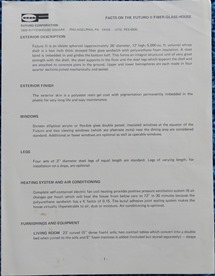 A copy of the standard warranty can be seen at left. 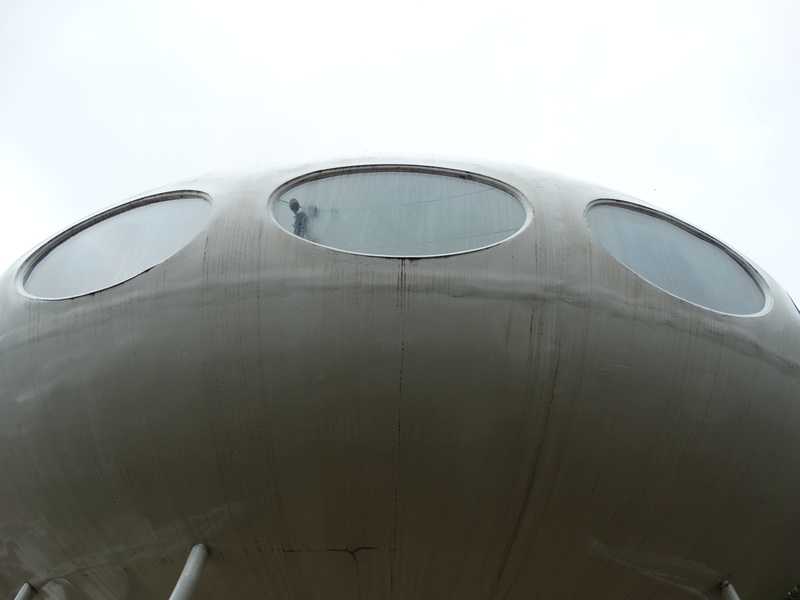 Post delivery and installation Ira lived in the Futuro House for its first 18 months on site and he tells me that he also lived in the unit at other times over the years; in total he has lived in the Futuro for something like 5 years. The interior of the Futuro has seen several changes over the course of its life; the original fixtures and fittings are now gone and the Futuro is empty inside [hence the lack of interior photos, with an empty interior one Futuro House looks much like another]. That said it is interesting to note that despite spending its entire life on one site and thus never having been disassembled the Futuro shows the same signs of deterioration as other Futuros at the join between upper and lower hemispheres; this can be seen in some of the photos at left. 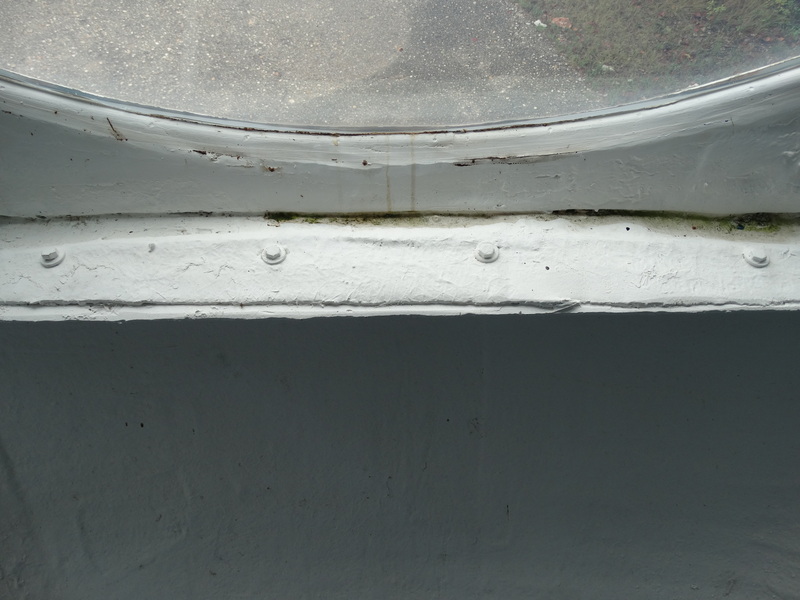 In addition even the upright joins between sections in the same hemisphere that were sealed at the time of manufacture show signs of deterioration. 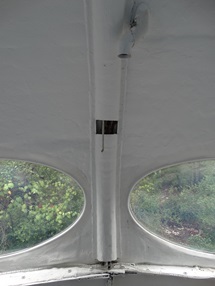 The entrance door is fully functional and controlled [from the outside] by means of a switch installed in the "tube" under the Futuro. 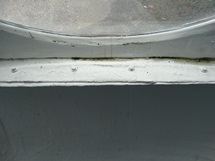 The mechanism by which the entrance door functions has been replaced and is not original. 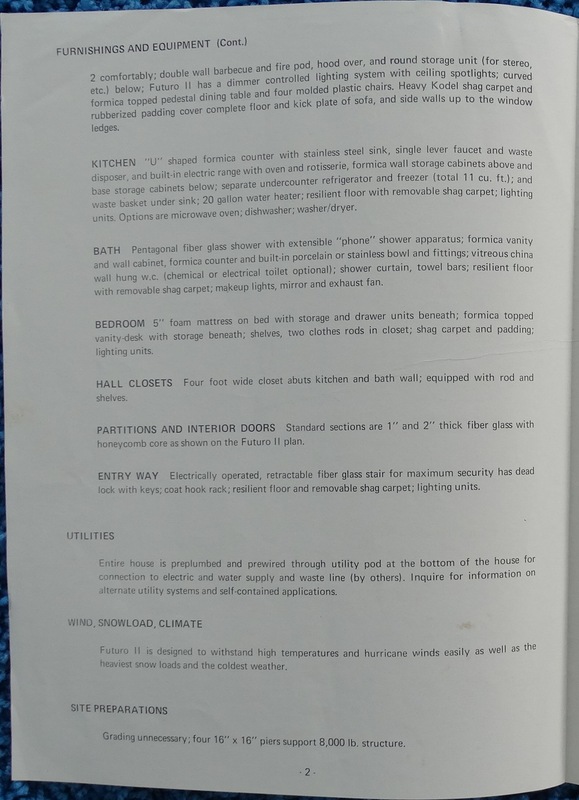 Ira tells me that he is planning some refurbishment work and is planning on investing in a new interior for the unit. What form that interior will take is currently undecided as Ira tries to balance the design between "restoration" and "modern functionality". I for one am eager to hear exactly what the decisions are and, Ira be warned, I will be "knocking on your door" once the work is done to see what the "new" Austin Futuro looks like. 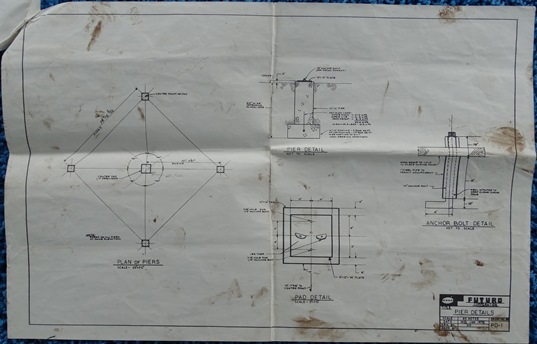 Finally in addition to the various letters and documents Ira shared with me [I could not photograph them all, it would have taken too long, but perhaps Ira will permit me another visit sometime on the future] I was able to take photographs of a set of various plans and blueprints. 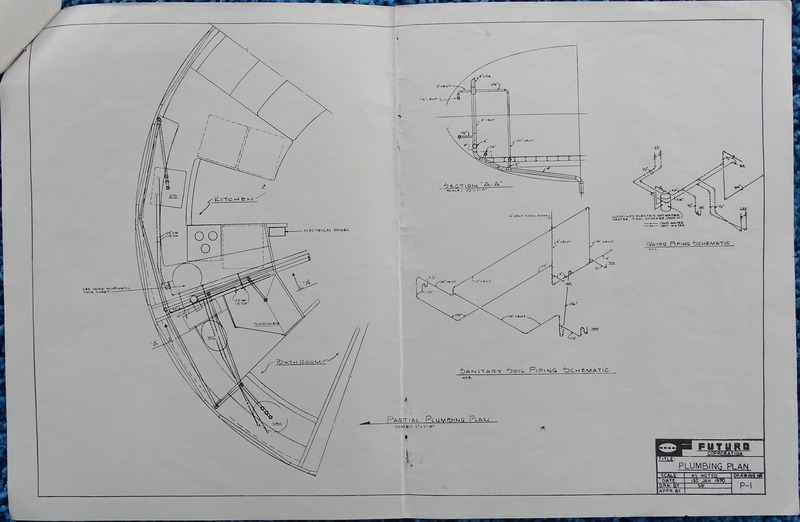 These are listed below and can be seen at left; clicking on the images of the plans will bring up high res versions which are readable. 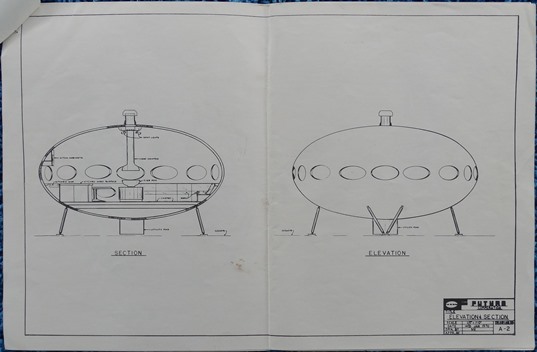 The first two plans listed are full size architectural "blueprints", the second two are smaller architectural drawings [that do not have the "blue" hue that presumably gives "blueprints" their name] and the remaining 5 are a set of copies of plans on smaller white paper; all are original and from the time the Futuro was purchased and installed. All in all I had a fascinating visit with Ira, Terry and the Austin Futuro and my sincere thanks go to Ira who invited me and to Ira and Terry for spending time with me. 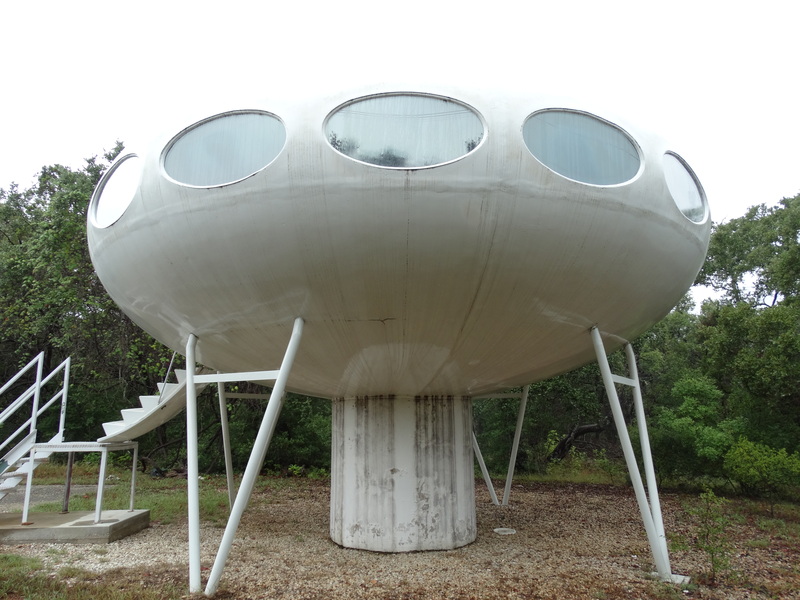 This week I received an email from the owner of a previously unknown [at least to me; I have never seen mention of it anywhere] Futuro House located in the vicinity of Austin, Texas. 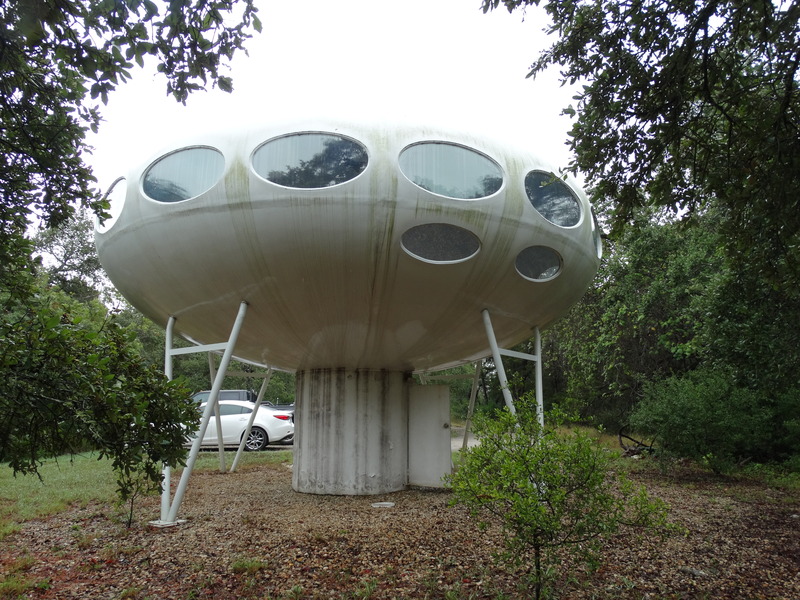 To steal a quote from a car salesman - the Futuro has had "one careful owner". 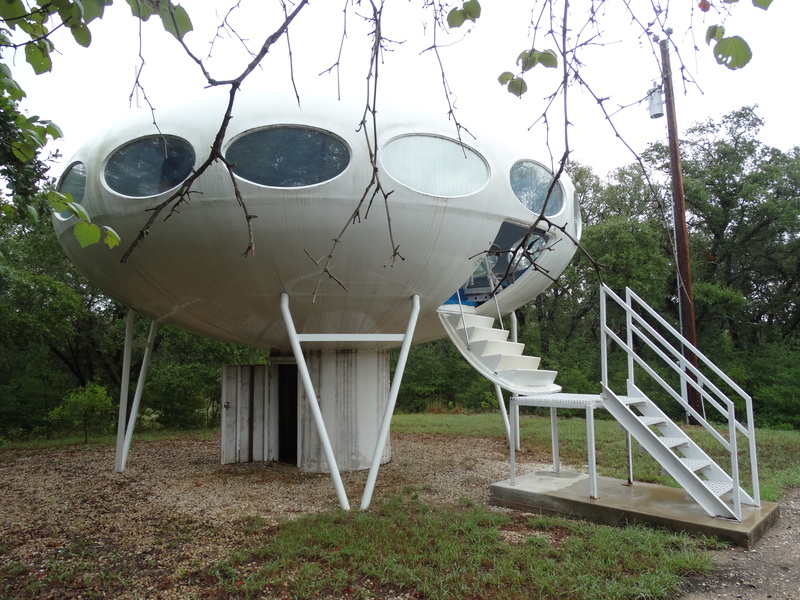 The owner tells me that the Futuro was purchased in 1970 [he still has the original purchase documents] and that it is still in use today. 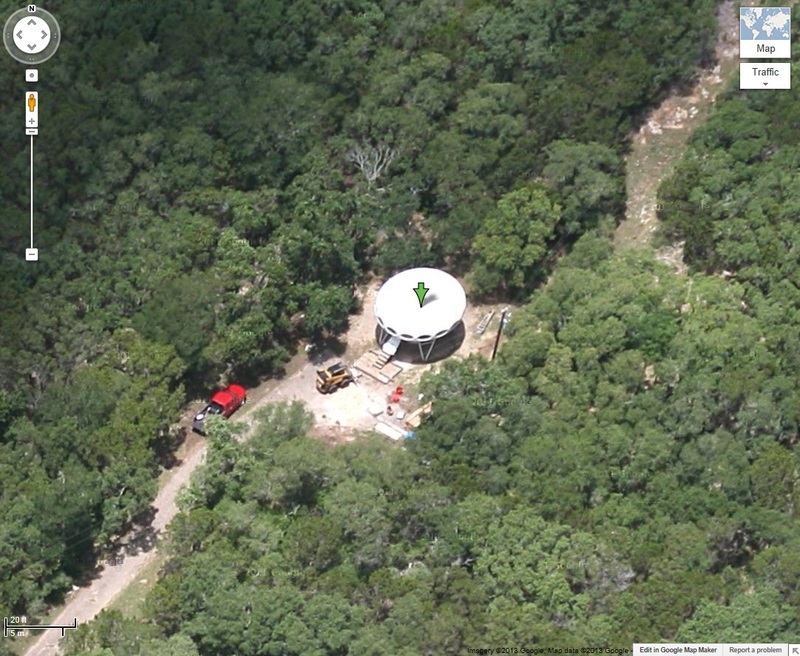 I was able to locate the Futuro in Google Maps by searching on the owner's name and the Google Maps screenshot above shows the Futuro as it appears in the latest imagery in Google Maps at full zoom. 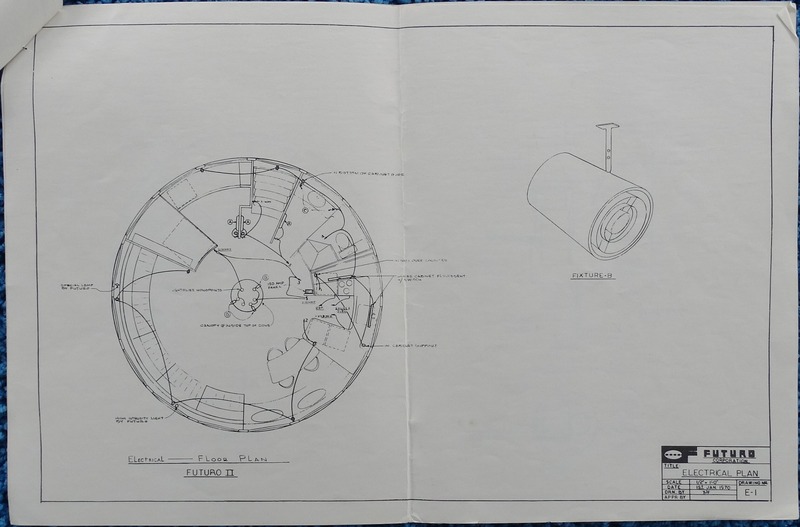 As expected Google Earth historical satellite imagery shows the Futuro on site as far back as the imagery goes; in this case 010695. Since the owner has managed to keep this location private for over 40 years [at least from the internet community at large] despite the prying eyes of people like me I have chosen to keep the owner's name and the Futuro's location private. 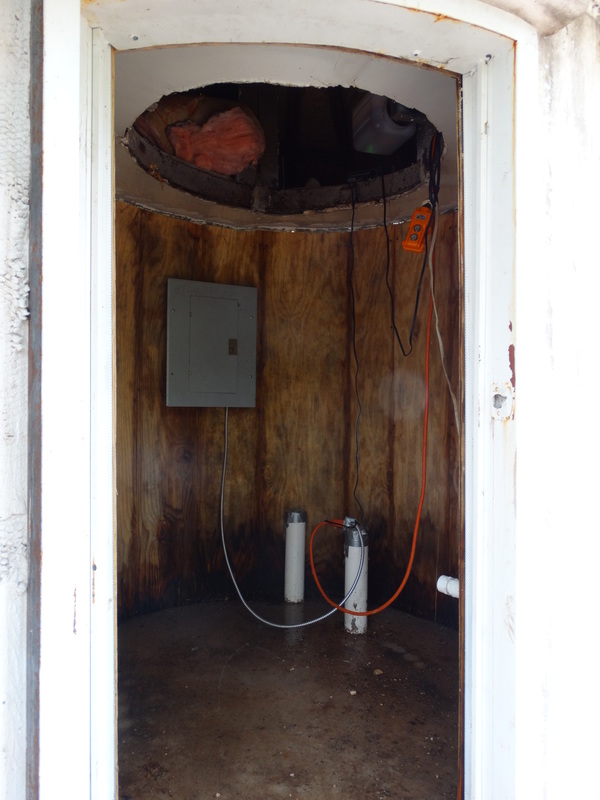 If at any point I am permitted to do so by the owner I will add the precise location information. In the meantime the Google Maps screenshot contains no information or detail that will identify the exact location. 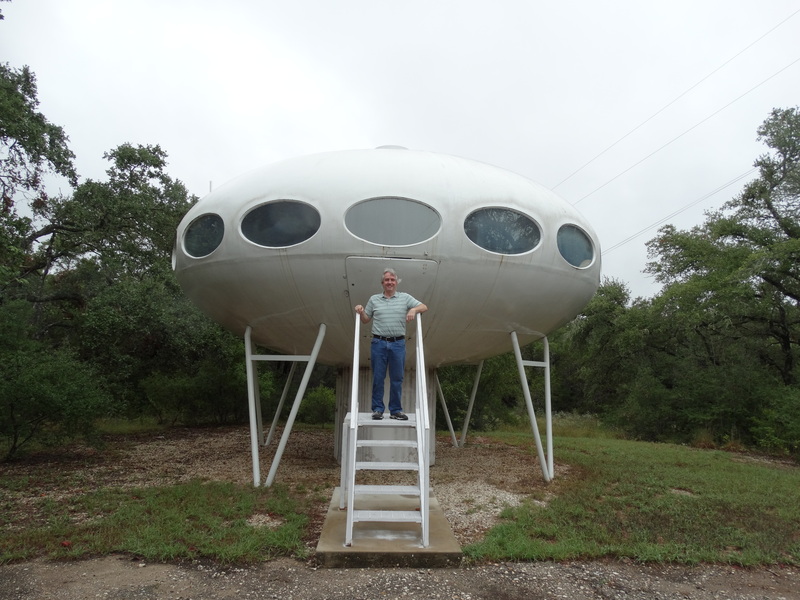 My thanks to the owner of the Austin Futuro for sharing this information and these photographs with me. Personal correspondence with the owner 031119.